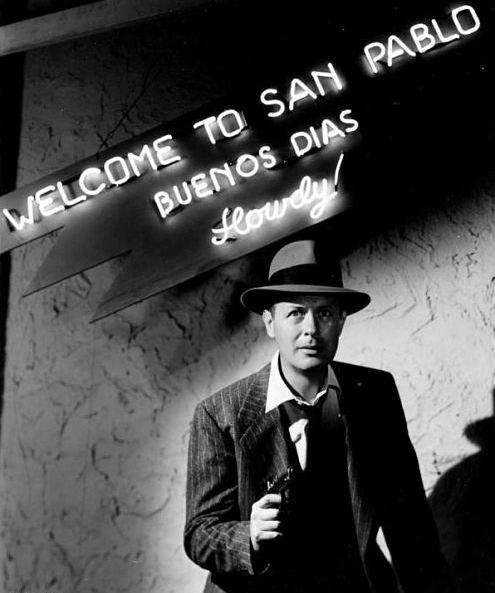 Robert Montgomery directed and starred in two movies released in 1947. The first, Lady in the Lake, was an interesting stylistic experiment — an adaptation of Raymond Chandler’s novel that was filmed entirely from private eye Philip Marlowe’s point of view. The second, Ride the Pink Horse, is more traditionally lensed. It’s based on a novel by Dorothy B. Hughes, with a screenplay by Charles Lederer and Ben Hecht. It’s also the better of the two films, so naturally it’s the one that isn’t available on DVD. Besides being a more satisfying and involving film, Ride the Pink Horse also lets Montgomery flex his acting chops. In Lady in the Lake, since we only see what he’s seeing, all we hear is his voice, and his performance is somewhat listless. 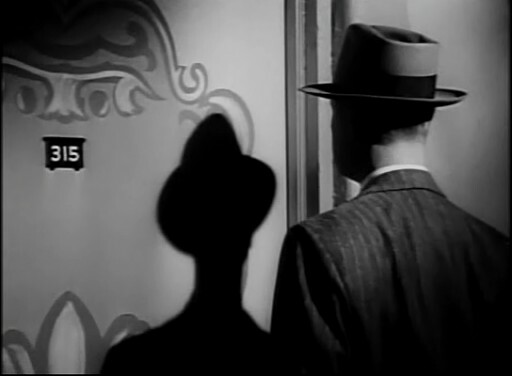 The character Montgomery plays in Ride the Pink Horse — Lucky Gagin — is a noir archetype; the returning veteran of World War II. 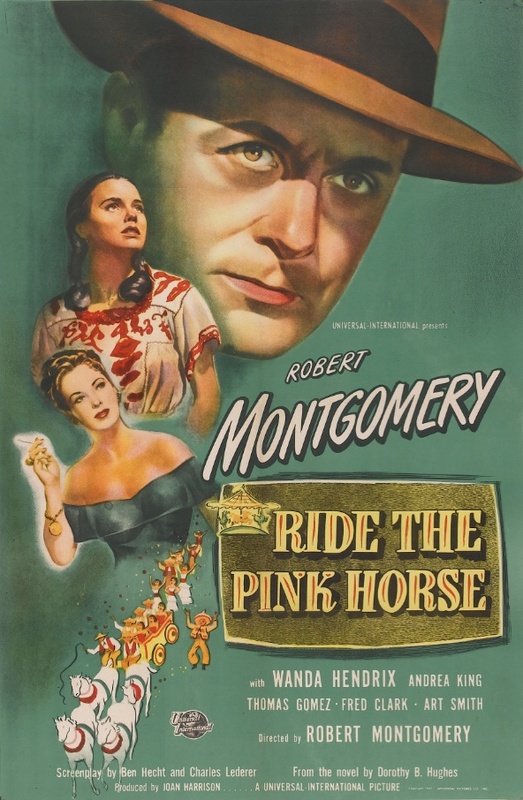 But unlike baroque, oneiric noirs like Somewhere in the Night (1946), in which a veteran suffers amnesia, brainwashing, or any number of high-concept emotional injuries, Montgomery’s character in Ride the Pink Horse is believable as a returning combat veteran. Lucky Gagin is a bitter, tight-lipped man whom violence hangs over like a dark cloud. As soon as he steps off a Greyhound bus in the little town of San Pablo, New Mexico, we can read in his face miles of hard road, lost friends, and random death. Lucky Gagin is obviously a less intelligent person than the man who plays him, and I wasn’t always convinced that Gagin was as dumb as some of his words and actions, but Montgomery’s performance is mostly believable. His pain-wracked sneer is especially easy to buy, which is good, since Gagin spends half the film clinging to life, bleeding out from a knife wound. Gagin is in New Mexico to blackmail racketeer and war profiteer Frank Hugo (Frank Clark) with a canceled check that proves Hugo’s involvement in criminal enterprise. Hugo ridicules Gagin for asking for a paltry amount. Nevertheless, there’s the sense hanging over the film that whether Gagin asks for one dollar or a million, he’ll never get it. In one of those little touches that I love, Hugo wears a hearing aid, and he often has to move the receiver clipped to his shirt into a better position to hear what’s going on. It’s never played for laughs, but it humanizes him, which makes his power and malevolence all the more believable. Like a lot of thrillers, Ride the Pink Horse is replete with characters whose motivations are vague and mysterious. The most mysterious of all is the Mexican-American Indian girl Pila (Wanda Hendrix), who develops an unnatural attachment to Gagin as soon as he steps off the bus. She foresees his death, and gives him a little doll to carry that she says will protect him. She also follows him around for the entire picture, despite the fact that he’s constantly mean to her. Long braids and brownface notwithstanding, Hendrix isn’t very believable as an American aboriginal, but she’s nice to look at, which makes up for a lot. The other angels who come into Gagin’s life — and who might be able to help him if he could only get over his distrust of everyone — are an elderly G-man named Bill Retz (Art Smith), who wants Gagin to help him bring in Hugo using legal means, and a chubby, good-natured Mexican named Pancho (Thomas Gomez), who runs a carousel, and who gives Gagin a place to sleep. It’s Pancho’s carousel that gives the picture its title, but if there’s a deeper meaning to the pink merry-go-round horse, I couldn’t suss it out. Does it symbolize death? Life? Everything? Nothing? Your guess is as good as mine. Ride the Pink Horse is a crisp, well-made thriller. It’s not quite an all-time classic, but it’s worth a look, especially if you’re a noir aficionado, and it’s well deserving of a proper DVD release. Posted in 1947, October 1947 and tagged Art Smith, Ben Hecht, Dorothy B. Hughes, Film Noir, Robert Montgomery, Thomas Gomez, Universal Pictures, Wanda Hendrix. Bookmark the permalink.